When was the last time you thought about your childhood dreams? The unabashed declaration of becoming an astronaut, veterinarian, firefighter, stay at home mommy? Before life started telling you that “it would be too hard”, “you’re not good enough”, or “be realistic”. Why, as adults, don’t we dream that way anymore? Why do we settle for the status quo– with ‘good enough’? Why do we let society and fitting in guide our life choices. I don’t know about you, but I don’t want good enough. I want big dreams, big adventure, big things out of life. I challenge you to spend some time this week dreaming BIG. Take some time to yourself and actually write down one dream or goal. Include a few actionable steps that you can focus on to make that dream or goal a reality. Rome wasn’t built in a day (haha– sorry for the corny cliche!).. your dream may take a while to see to fruition. Sometimes I get overwhelmed with my goals for Unapologetically You, especially when I see so many others excelling at what I want. But don’t give up. Keep hustling. I promise it will be worth it in the end. To get you started, here is a fun mad lib all about inspiration! Inspiration is the hot topic of the #sweatpink community this week as Fit Approach has partnered with Lorna Jane to promote the release of her new book Inspired. Join us on Instagram this week for the #LJInspired Challenge and a chance to win a copy of Lorna Jane’s book. I believe that the key to a happy life is dreaming BIG [noun]. Dreaming BIG [same noun] inspires me to be the motivated [adj] person that I am today. I am lucky to have Nick [person] and my family [person] in my life because they inspire me to live life to my fullest and to chase my dreams. My dream is to one day run an ultra marathon [verb] and even if it takes blood, sweat, and tears [noun], I know I’ll get there because I’m not afraid to dream big! While I dream big, I hope to inspire others by living a positive and encouraging example. 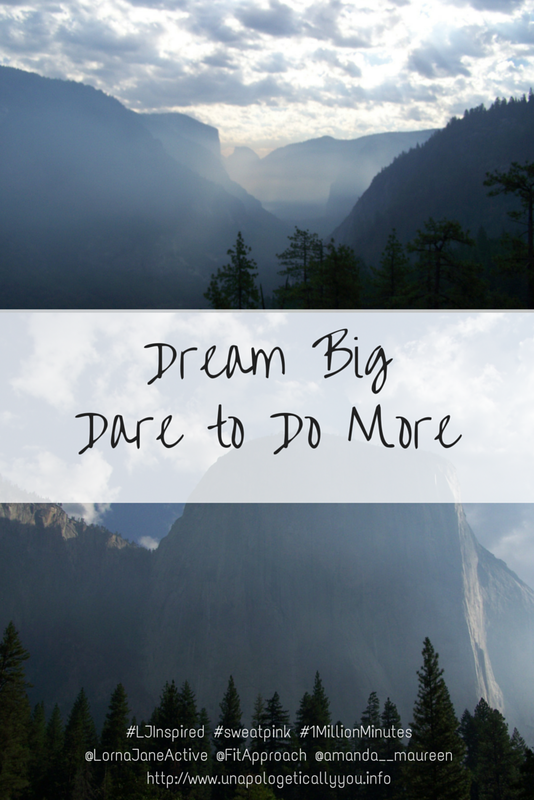 Day 1 (Monday, July 13th): How do you dream big? Day 2 (Tuesday, July 14th): What’s your fave healthy swap? Day 4 (Thursday, July 16th): What does happiness mean to you? Day 5 (Friday, July 17th): What makes you an #LJInspired girl? 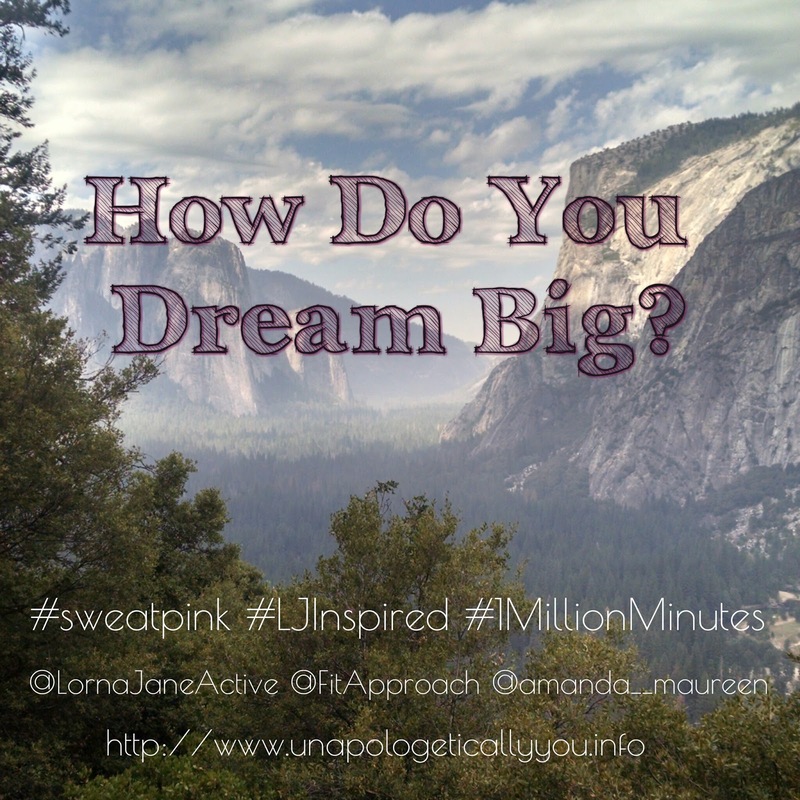 Make sure to tag @LornaJaneActive, @FitApproach, #sweatpink, #LJInspired, and #1MillionMinutes! Your turn! Tell me how you dream BIG? What actionable steps will you make this week to chip away at your goal? If you are digging the vibes here at Unapologetically You, I’d love for you to sign up for the monthly newsletter!